Ethiopians working enthusiastically to start Generating Power from two of its big turbines at GERD! 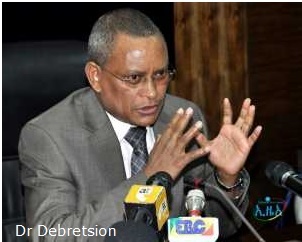 According to Dr Debretsion Gebremichael Deputy Prime Minister for Finance and Economic Cluster and Minister of Communication and Information, the Grand Ethiopian Renaissance Dam (GERD) so far consumed 46 billion birr, out of which 7 billion has been collected from the public. Ethiopian Diaspora contributed 600 million birr. The remaining 38.4 billion has been covered by the government, he indicated. Some 4 million cubic meter concrete so far been poured as the construction of the dam reached at 47 per cent, Dr Debretsion, who is also member of the Executive Committee for National Popular Mobilization Committee, said at a press conference he gave to local journalists. Two of the 16 turbines have already reached at the dam site from abroad and the remaining work is to install the tribunes and decide the amount of water the reservoir holds in consultation with Egypt and Sudan. The two turbines are the biggest of all and getting them to the site was a huge task that went smoothly. After the amount of water is known and once the two turbines go operational, they will begin generating 750 MW power, he said. According to the Minister, there is a plan to manufacture the remaining 14 turbines here at home. Additional costs will not be required to finalize the dam as the analysis made for this purpose rather showed a 5.6 billion birr decrease from the initial budget, he stated. Dr. Debretsion further noted that preparations have been finalized to launch new fund raising program so as to scale up the participation of the public to the dam which Ethiopia declared to build by its own resources. In addition to the SMS (8100A) and bond sale, tombola lottery and music concerts will be organized in various countries, he said.